Failed ESA assessments, I wish that I could destroy that building it’s hell in there. 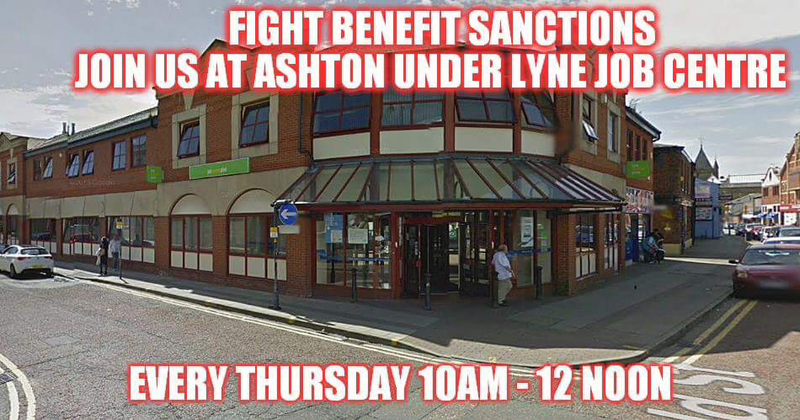 Welcome to Ashton Under Lyne Jobcentre..
You know that it’s been over four years since we started the weekly demos and you would have thought that things would have got better, problems would be ironed out they said… It pays to work… The lies were constant, they still are and the problems haven’t been ironed out. They’ve become much worse. I sometimes wonder how much crap the government will continue to give us, how much more will people have to suffer. The government are certainly relentless in their persecution of the poor and this isn’t going to change soon. Today was another cold morning and more snow has been predicted, its been a very long winter and shows no signs of ending. Anyway I packed my bag as usual and set off to help people. I started really early this morning because I stopped to help a chap whom I can’t discuss on here. His problems are very serious and I did my best to help and have other local organisations. They can only do so much, and the police are really stretched by a lack of funding. They do their best though. I hope that he is OK and his words will haunt me tonight. Life isn’t supposed to be all about suffering but for some it is. I arrived at the Jobcentre and helped to get the food parcels out of the car. Some went straight away for various reasons, all had gone by the end of the demo. We shouldnt have to feed people like this, but the government nor the DWP cares nothing for them. Trying to persuade people that people like us do care can be very hard work at times. People are used to being shoved to one side like yesterday’s newspaper. A lady rushed into the Jobcentre worried that she would be late for an appointment as did a man. Both had their heads down and looked unhappy. They probably are unhappy, I don’t know anyone who is happy whilst claiming Universal Credit. We spoke to two young girls both in Foster care. They are 17 and both told me that they might have to leave their accommodation soon. The law states that they should be 18, but they often encourage them to leave earlier. My heart went out to them, one was carrying her worldly possessions in her bag and both are trying to navigate the whole DWP system. It’s awful and these young women deserve so much more than this. They can’t see any opportunities in life, whilst others appear to have so much more more opportunity. The class divide certainly exists doesn’t it. I spoke to a man who had failed his ESA and is now fighting to get it reinstated. He’s doing his best and he’s a lovely chap but he shouldn’t be struggling like this. 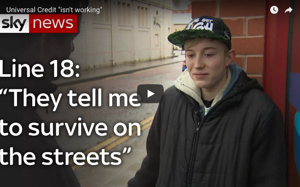 He also has to walk miles to Ashton Jobcentre because his local Jobcentre has now shut down. He told me that he wished that someone could destroy the Jobcentre because they have been awful to him. I saw several young people constantly walking in and out of the Jobcentre for being a few minutes too early. This is the norm but they should let them sit inside. I spoke to lots of people, paid a visit to the local ADS down the road, signposted many people, gave people hugs, fed them and gave them hope. I’m tired, but if we wernt there then these people would fall between the lines and become lost. I will do everything thug I can to prevent another suicide, admission to hospital etc. Ive seen too many people suffering like this and whilst they have a voice they aren’t heard for the best part of the time. I have hope that things will change one day but for as long as we have universal credit I fear that we or I will still have to be there to help people. Love to you all, and thank you for reading. Also massive thanks to Gordon and Roy for braving the cold weather and for putting up with me. Thank you so much to everyone who reads and supports my blog it means the world to me and I will catch up with my emails ASAP, I’ve been very busy with trying to keep the campaign going and being a single mum. I won’t lie it’s hard but its worth the difficulty. If we make a difference to one person’s life then thats a job well done in my eyes and I shall continue to hold this government to account for their cruelty. Full Universal Credit roll out, man sat outside Jobcentre for over 2 hours in awful weather, rude staff member and rude passer by. Will it ever end? You have to look for work in Liverpool and clothes are a privilege. This weeks blog. Your blog moves me to tears every time I read it. You are doing an amazing job. As a disabled person I can’t spare much but would like to donate a little of my DLA to you but I can’t find the link to donate. Please can you send it to me? This blog always makes me sad at how our country is treating people. but uplifted by how a small number of people fight back against it by helping each other. Pingback: “Failed ESA assessments, I will I could destroy that building it’s hell in there. Welcome to Ashton Under Lyne Jobcentre..” | The Poor Side of Life | COMRADE BOYCIE: VIVA THE ANTI-tORY / BIG BROTHER REVOLUTION! Yes, I know what you mean, I feel EXACTLY t he same about my Jobcentere too! I wish it would be struck by lightening & burn to the ground. Preferably whilst Esther McVile is making a visit! Haha yes, I call her Fester McVile, what she lacks in competence she makes up for in malice. I have to go to the Jobcentre tomorrow for my fortnightly face-off confrontation with a Work Coach / Adviser / Dole Clerk, to justify my existence in return for the lousy 70 quid a week pittance I receive from our caring sharing excuse of a Government.